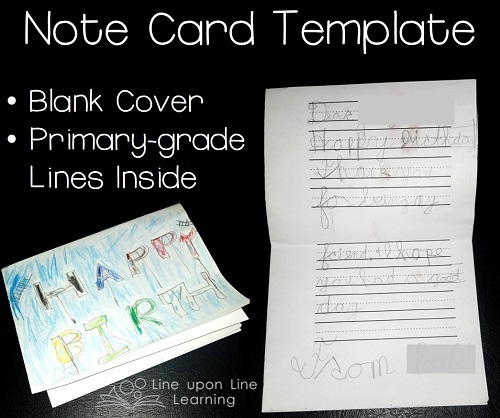 It is about time that I provided a blank note card alternative to my Thank You Cards product for my son’s personal use. ‘Tis the Season for….writing Christmas cards! I admit, I am really bad at this one. I put it off every year. A few years I have not sent anything. My son, on the other hand, loves to create his own birthday cards, Christmas cards, “How are you?” cards, and so forth. But, he definitely still needs to have primary-grade lines to help him keep straight. He really enjoys having the option to write and draw whatever he wants on the cover. And, of course, he does not argue about this kind of handwriting practice! How do you encourage your kids to write outside of the traditional “worksheet” learning? Do you send Christmas cards?